It's time to think about fertilizing okra after the seedlings reach 6 inches tall. Okra plants do best when they receive regular water, although they are able to tolerate mild drought conditions very well. 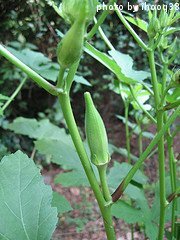 Ideally, your okra plants need about an inch of rain per week to thrive, become large and produce lots of pods. However, okra has the ability to handle longer dry periods very well. If the plant gets rain after a couple of weeks of dry weather, it usually bounces back nicely. 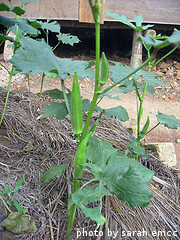 Okra can be watered at the same time as other vegetable plants in your garden. Just focus your efforts at the base of the plants and water slowly enough so as not to erode the soil away. Avoid watering the tops of the plants as wet foliage is a breeding ground for fungi. It's a good idea to water in the early morning hours, that way the afternoon sun will evaporate any excess water that was not absorbed into the soil. 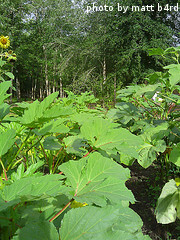 A layer of mulch can be applied around your okra plants after they are several inches tall. This will keep the soil moist and cool and prevent weed growth. Grass clippings, chopped up leaves or straw all work well as mulch and can be tilled into the soil at the end of the growing season. Most of the time, okra will do just fine in nutrient-rich soil. However, if you your garden soil isn't ideal, you may want to think about fertilizing okra plants. Generally, a well-balanced fertilizer can be applied after the seedlings reach 6 inches tall. If you want to use a granular type fertilizer, a 10-10-10 formula works well. Just scatter the granules on the ground around the plants at a rate suggested by the fertilizer manufacturer. Generally, the application rate is about 1 pound every 100 square feet. Try not to let the granules come in contact with the plants as they may burn. Once the granules are scattered, water them in well. Another convenient option is to use a water soluble fertilizer and apply it when you water your plants. Just mix the fertilizer with water in a jug, watering can or hose-end sprayer according to the manufacturer's recommendations. You should only need to use a water soluble fertilizer every 4-6 weeks after the plants reach 6 inches in height. In our own garden, we apply a balanced granular fertilizer a few days before we even plant our okra seeds. We scatter it on the soil, water it in well and then till the soil one last time before planting. After that, we switch to a water-soluble product and fertilize a couple of times during the growing season. If you are interested in growing okra organically, you can amend the soil with compost or composted manure before planting. There are also a variety of organic fertilizer products available at your local garden center. Fish emulsions are a good organic fertilizer option. Now that you know about watering and fertilizing okra, it's time to think about harvesting those tender pods.